Bone, composed primarily of calcium, is a living tissue which contains cells, collagen, and other substances. The body is constantly breaking down and rebuilding bones. With increasing age, the rebuilding processes cannot keep up with the breakdown mechanisms. The exact reasons for this are not completely understood, but over time, bones can become very thin and fragile and may break under the slightest pressure. Maintaining strong bones and teeth is essential to your health. Weak bones can result in osteoporosis‚ leading to painful broken bones and falls; this can inconvenience you and prevent you from living life to the fullest. RHP® Bone Support Formula contains unique plant forms of calcium and magnesium that are highly bio-available. Evidence indicates that taking adequate calcium and Vitamin D throughout life, as part of a healthful diet, along with physical activity, helps build and maintain good bone health. Specific vitamins and minerals are included in this formula to help your body utilize and absorb the calcium more efficiently. AlgaeCal® is a unique plant source calcium and magnesium mineral complex derived from a South American marine algae. AlgaeCal® is hand harvested from the beaches of South America without harming the environment in any way at all. AlgaeCal® is a naturally occurring mixture of bone building nutrients, containing calcium, magnesium and several other bone supporting ingredients such as boron and silicon. It is important to balance your calcium intake with magnesium, because these two minerals act together as a synergistic team. Calcium and magnesium must dissolve in your stomach before it can be absorbed in your intestines and used by your body. AlgaeCal® dissolves in the stomach and therefore is much more bioavailable. Vitamin K2 activates a protein hormone which is needed to bind calcium into the matrix of your bone, which appears to help prevent calcium from depositing into your arteries. So while increasing calcium is good for your bones, it is not so good for your arteries, which can become calcified. 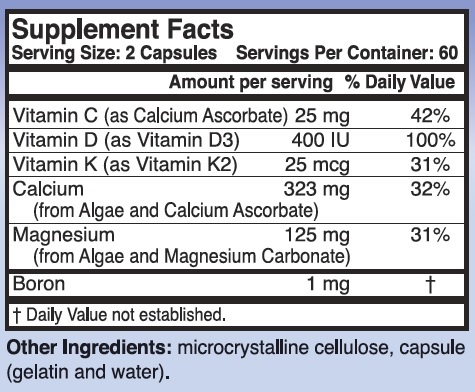 Vitamin K2 helps protect your blood vessels from calcifying when in the presence of high calcium levels. Elderly patients who have fractures have significantly lower levels of vitamin C. Those who have higher levels of Vitamin C tend to have less fractures. Bone mineral density tests show that those with sufficient vitamin C levels usually have healthy bones. Vitamin C mineralizes bones and stimulates bone forming cells to grow. At the same time, Vitamin C prevents too much degradation of bone by inhibiting cells that break down the bone. Vitamin C is vital to collagen synthesis (the body creates more collagen when there is more Vitamin C) and is an excellent antioxidant. Collagen is the glue that holds together ligaments, tendons and bones. Your body requires certain levels of these nutrients in your bloodstream at all times. These nutrients aid the body in running the nervous system‚ blood clotting‚ and muscle contraction. If it doesn’t have enough of these nutrients, it’ll leech them from your teeth and bones if necessary. Proper nutrition prevents this from happening. We're so sure about the quality and effectiveness of the RHP® Bone Support Formula, and that you will experience the results you want, that we offer a 90-day money-back guarantee. A bottle containing 120 capsules is $33.20. 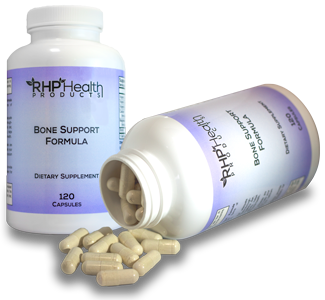 Order your RHP® Bone Support Formula below and experience the results for yourself! Order the RHP® Bone Support Formula Now!